Peanut butter and chocolate are a match made in heaven. Like any healthy relationship, they bring out the best in each other. 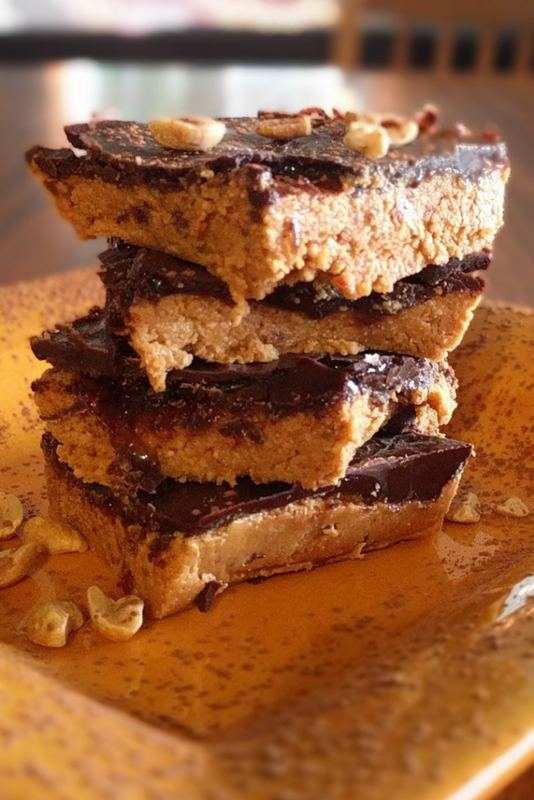 These peanut butter chocolate bars are made with honey and dates to sweeten them up a bit. And the chocolatey peanut butter flavor combo is as good as ever. My sister and her husband are going a full year without sugar. Super impressive if you ask me! She asked me a couple weeks ago to develop a recipe for a dessert that is sugar free, but still delicious. Here’s what I came up with. It took a few tries, but I think this one is a winner. It’s sweetened with dates and honey (but not much of either). These bars come together quickly. And bonus: no oven is required. If you don’t know already, I’m a big advocate for cooking food from scratch. Food prepared at home is fresher and more nutritious. Not only that, you get to choose what to put in (delicious healthy ingredients) and what to keep out (preservatives, bad oils, fillers, and chemicals). If you’re interested in making healthy snacks at home, sign up for the Members Only Free Resource Library at the bottom of this page. I made an awesome cheat sheet for healthy snack substitutions just for you! To get the best flavor, use the best ingredients you can. If you use store bought peanut butter, make sure it’s a kind that only has peanuts as the ingredients. No extra oils, preservatives or anything like that. We just want the good stuff. For more information on oils, read this article. If you make your own peanut butter in a food processor, don’t process it too long or the bottom of this dessert will be a mess to eat. Stop processing right when it gets to be a nut-butter consistency (not too thin). If you’d prefer to use a different nut butter, I’m sure that would work just as well. It will just have a slightly different flavor. I soaked the dates in warm water for about 5-10 minutes to soften them up a little before adding them to the food processor to blend. If you have a favorite chocolate bar (maybe something like this), you could just melt it down and use it for the topping. But for this recipe we’re not going to do that. 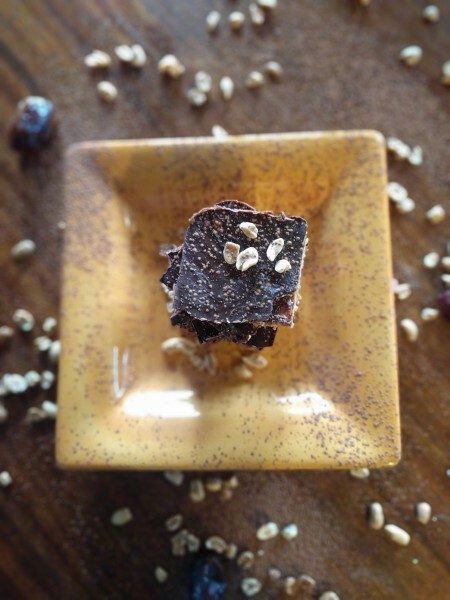 The goal with this recipe is to eliminate refined sugar and still have a tasty treat. Instead, we use coconut oil, cocoa powder, and honey as the chocolate topping. It hardens nicely in the fridge, and barely has a coconut flavor to it. You can double or halve the recipe, if desired. 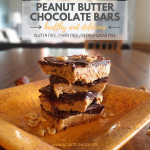 I hope you enjoy these peanut butter and chocolate treats! Please comment below and let me know what you think. Also, don’t forget to save for later! 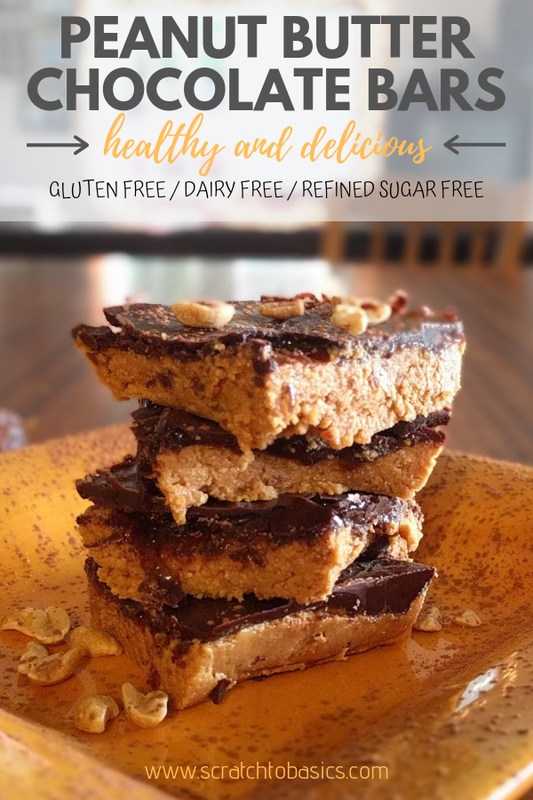 These peanut butter chocolate bars are free of refined sugar and full of flavor! Get your container out (8″x 8″ glass container works great). Soak dates in warm water for 5-10 minutes while you get the ingredients together. Use food processor or blender to blend up dates into a paste. Add peanut butter and coconut flour to food processor and pulse a few times to combine. Scoop the peanut butter mixture into your container and press down with a rubber spatula. In a small bowl, combine melted coconut oil, honey, vanilla, and cocoa (or cacao) powder. Whisk to combine, and add salt, to taste. The chocolate mixture will be liquid. Pour over the peanut butter mixture. If your peanut butter mixture is poking through, gently push it down so the chocolate covers it completely. Sprinkle a little salt over the top. Place in fridge until hardened (1-2 hours). If you’re in a big hurry, you can speed the process by putting it in the freezer for a couple minutes, then transferring it to the fridge. I like these served cold. They’ll hold up best when cold. But room temperature works great if that’s what you like.